12 year old Lucas Haynes wrote, directed and acted in this short film which explores a child who has severe dyslexia and whether he should take the miracle pill offered to him by his psychologist to make his dyslexia go away for ever. The film also includes commentary from Lucas and an interview where he talks with Liz Dunoon about what makes the message in this film so important for others with dyslexia. This film is an ideal tool for teachers, students, specialists and anybody who is struggling at school and may have dyslexia. Learn to read and spell through typing. This program is appropriate for all ages from 6 years to 97.As the student learns to type, they are also taught the sounds of the English language, to spell and to read. They do this using all of their senses, hearing, sight, touch and movement. This unique attribute sets this program apart from other typing tutors as it uses spoken words and is based on the scientifically proven reading program Alpha to Omega. This program has taught thousands of people to learn to read throughout Europe and the world. It changes lives and should be in every school. Go online to see youtube clips of the program in use. Visit www.ttrs.co.uk to read the scientific reports. Contact us to receive a free trial for your school. School Licence Starts at $870 for 10 users plus GST per annum. Lucid is the market leader in software for assessing and training people with learning difficulties in particular dyslexia. It is used in over 8,000 schools in Europe, is scientifically proven and is recommended by the British Dyslexia Association. 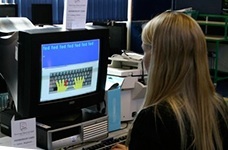 Since its release in 1996, Lucid CoPS has become established as the leading computerised assessment system for children in the 4-8 age range. Cops is currently used by over 6,000 schools in the UK and elsewhere in the world, and several foreign language versions have been developed. Lucid CoPS has proven scientific validity for the early identification of dyslexia, and can help teachers identify many other cognitive difficulties that can interfere with children’s learning. Lucid CoPS comprises nine tests of fundamental cognitive skills that underpin learning. Each test is presented as an attractive and enjoyable game that takes about five minutes. Results, in the form of graphical profiles and individual response records, clearly show children’s strengths and weaknesses in comparison with national norms. Percentiles, standard scores and age equivalent scores are provided. By understanding the child’s strengths and weaknesses, potential problems can be spotted at an early stage, and appropriate learning and teaching strategies can be put into place to overcome difficulties and prevent failure. The graphical profile alse gives the teacher important insights into children’s learning styles so that educational experiences are optimised for the individual. Although Lucid CoPS can enable the teacher to identify dyslexia – if necessary, before the child has commenced reading the instruction – it does not demand that the label ‘dyslexia’ be used. Many teachers are uneasy about applying diagnostic labels at an early age. Instead, CoPS enables teachers to understand the cognitive limitations that lie behind dyslexia, and to tackle these directly without needing to be concerned about labels unless they choose to. Lucid CoPS is accompanied by a comprehensive teacher’s manual that explains how to interpret the profiles of Lucid CoPS results so that teaching and learning can be tailored to suit the needs of individual children. Suggestions for a wide variety of teaching strategies, including suitable computer programs, are included. Is the solution for quick screening for dyslexia in the 4 to 15 age range. The computer gives each child three enjoyable and non-threatening tests that are sensitive cognitive indicators of dyslexia. Each Screening component has been individually standardised, validated and calibrated to maximise accuracy in detection of dyslexia and prevent dyslexic children ‘slipping through the net’. There are very low rates of false positives (‘false alarms’) and false negatives (‘misses’). What does LASS 8-11 enable the teacher to do? Interpretation of LASS results is straightforward, using the accompanying comprehensive teacher’s manual. Percentiles, standard scores and age equivalents (including reading and spelling ages) are given. Results, in the form of graphical profiles and individual response records, clearly show childrens’s strengths and weaknesses in comparison with national norms. Use of a standardised graphical profile makes it easy to spot students who are underperforming. LASS standardised norms cover the full ability range from below average to above average pupils. Any difficulties of a dyslexic nature or caused by underlying cognitive problems in phonology and/or memory can swiftly be identified. Assessment can be carried out on a regular basis to monitor progress. This information can be used in formulating Individual Education Plans (IEPs) and is valuable when considering whether or not to request a formal assessment by an educational psychologist. It can aslo be used as supporting evidence when applying for special arrangements in GCSE and other examinations.